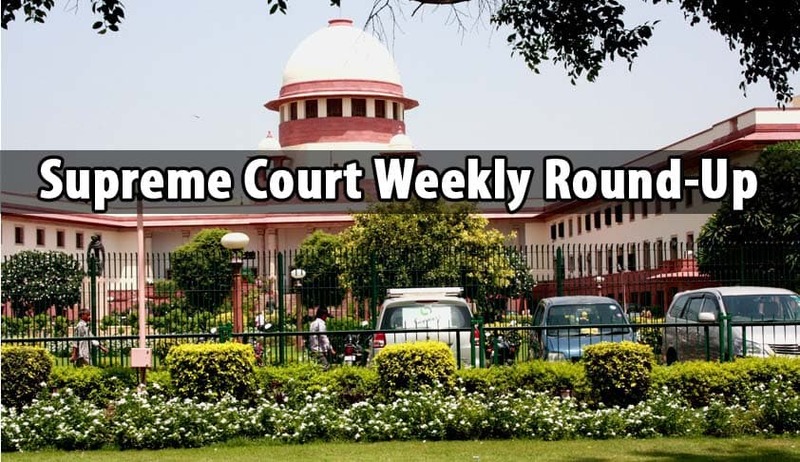 The Supreme Court bench of justices Adarsh Kumar Goel and UdayUmesh Lalit, vacated the stay, and modified the High Court’s order, directing the state Government to complete fresh selection process on or before December 31, 2017. The Tripura High Court had terminated the appointment of 10,323 government school teachers on various grounds. Calcutta High Court Judge, Justice Karnan against whom the Supreme Court has initiated contempt proceedings finally appeared before the Chief Justice-led seven judge bench. After an hour-long gripping exchange between Karnan and the bench Chief Justice J S Khehar gave the HC judge four weeks time to file a written reply. The Supreme Court set aside an order of Central Administrative Tribunal, which had held that a casual labourer (in Railways) after having been granted temporary status is entitled to reckon 100 per cent period of service with temporary status for pensionary benefit. Setting aside a high court judgment, which suo moto applied a provision of law while deciding a second appeal, the Supreme Court reiterated that the high court has no jurisdiction to decide on a second appeal on a question which is not framed as required under Section 100(4) of the Code of Civil Procedure. The Supreme Court acquitted five accused in a 27-year-old murder case on the basis of serious discrepancies that arose in the evidence produced by the prosecution. The Supreme Court, in Himachal Pradesh Financial Corporation vs. Anil Garg, held that the concept of rule of ‘public policy’ cannot be invoked to facilitate a loanee to avoid legal obligation for repayment of a loan. Supreme Court in its ruling in M/s Berger Paints India Limited v. CIT held that premium collected by companies on its subscribed share capital does not come within the ambit of “capital employed in the business of the company” as given under section 35D of the Income Tax Act, 1961. Hence, a company cannot claim “premium” received on shares as deduction. The Supreme Court, in Union of India vs. Besco Ltd, held that even if an arbitrator is specified in the agreement for arbitration, the chief justice or the designated judge is free to appoint an independent arbitrator, having due regard to the qualification, if circumstances so warrant. In a major setback to automobile industry, the Supreme Court, observed that “health of the public is more important than commercial interest of manufacturers” and banned the sale and registration of pollution-causing BS-III compliant vehicles across the country from April 1 when BS-IV emission norms will come into force. The Supreme Court convicted five men in relation to the murder of an RSS man in Kerala, which took place 23 years ago. Twenty-one persons were accused of murdering one Suresh Babu. Seven of them were convicted by the trial court for murder. The high court, on appeal by the convicts, acquitted four of them viz. Majeed, Ummer alias Podi Ummer, Balaji, Muralledharan and Hasheem alias MuhammedHasheem. The state and complaint approached the apex court against their acquittal. The legal maxim actus curiae neminemgravabit, meaning no one should suffer any prejudice because of the act of the court, has to get sustenance from the facts, held the Supreme Court bench of justices Dipak Misra and Amitava Roy, on March 21. After hearing petitions challenging ban on liqour vends within 500 metres of state and national highways for one-and-half hours, Supreme Court on Wednesday said it will continue hearing tomorrow and pass an order. In a significant Order the Supreme Court of India directed that CCTV cameras may be installed inside the courts and at such important locations of the court complexes, at least in two districts in every State/Union Territory. The Court directed that the installation of cameras may be completed in three months. The Supreme Court stayed Bombay High Court judgment which had dismissed the challenge against levy of stamp duty on contracts entered into by advertising agencies with their clients and with media companies. Supreme Court of India on Thursday referred the ail‘tripletalaq’ and related matters to the Constitution Bench. The Bench headed by CJI Khehar said that a constitution bench will hear petitions challenging the constitution validity of triple talaq, polygamy and nikahhalala from May 11. Concerned over injuries suffered by minors due to use of pellet guns by Armed forces for their involvement in protests in the Kashmir Valley, Chief Justice of India JS Khehar’s bench told the Centre to find an alternative solution to control them, observing that “it is life and death issue”. In a major step, the Supreme Court on Monday asked the Centre to file a roadmap and detailed plan of action to deal with “the serious” issue of farmer suicides within four weeks.